What Comprises Scientology® Study and Training? Whether participating in religious services in a Church of Scientology, or pursuing their education of the Scientology scripture at home, study of the works of L. Ron Hubbard is a part of daily life for Scientologists. The Scientology materials comprise the largest body of information ever assembled on the mind, spirit and life — the foundations of which are built upon Mr. Hubbard’s original books and recorded lectures. Thus, Scientologists, whether or not currently participating in services in a church, and people new to Scientology, are all encouraged to continue their progress in the study of the religion at home. Some elect to study Scientology materials through extension courses by mail. 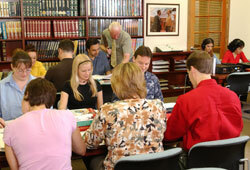 Others conduct a study of the books and lectures to obtain understanding of the subject. This is an integral part of a Scientologist’s continuing route towards higher states of existence. Training, as practiced within a Church of Scientology, is the way to learn the technology of Scientology, and technology implies use. There is a gap between knowledge and the application of that knowledge. Training bridges that gap, and by becoming fully trained, a person becomes able to use the truths found in Scientology to actually improve conditions in life. Thus, one will also find Scientologists studying the works of L. Ron Hubbard in any Church of Scientology. If one were to look in on them, anywhere, the scene would be the same. Students seated in designated course rooms at tables read the written words of Mr. Hubbard, dictionaries at hand. Some, wearing headphones, listen to his lectures, while others drill the principles of application with other attendees — all in a precisely laid-out sequence, course by course. Carefully supervised by ambulant Course Supervisors, specially trained to monitor course progress and provide help and guidance, here one sees enthusiastic students who are not only assimilating data but also learning how to apply it. A trained Scientologist understands why personal relationships fail. But more, when faced with a friend’s marital discord, he can do something effective to resolve the difficulty. Confronted with a child who is failing in school, he can find out why the child is failing, remedy the problem permanently and salvage that young person’s future. Other subjects encompassed by training include the fundamentals of communication, how to restore personal integrity and honesty, ways to assist a person to recover spiritually from illness or injury, solutions to drug problems, illiteracy, criminality and many other aspects of life. Training gives Scientologists the skill to resolve real-life situations — problems big and small — that might otherwise appear unsolvable, through understanding the underlying causes and the remedies for each. Life is improved on a gradient. Similarly, spiritual advance occurs a bit at a time. Thus, Mr. Hubbard developed an exact route of training consisting of successively attainable improvements, done in a proper progression that enables one to ascend to a very high state indeed. That ascent in Scientology brings one closer and closer to a full understanding of the nature of man as a spirit and one’s relationship to the Supreme Being. Today, as man moves through the 21st century, the need for effective solutions is more urgent than ever. Scientology can provide them. It is a workable system. Evidence of this is seen in the lives of millions of Scientologists and the positive effects they create. Individuals improve their lives through Scientology. As Scientologists in all walks of life will attest, they become happier and enjoy greater success in their relationships, family life, jobs and professions. And in turn, their actions in society improve conditions for all.